Episode one of The Miseducation of Dallas County podcast explores the “morbid fear of taxation” in the 1870s regarding education, and the similar opposition to raising taxes today. This episode’s historical content is heavily indebted to the work of historian Jackie McElhaney. She has a book titled Pauline Periwinkle about the fight for women’s suffrage in Dallas. This podcast is dedicated to educators everywhere. The future is in your hands. Rob: It was definitely a day of anticipation. Waiting for that meeting to start, wondering how many members of the community would show up to a Friday night school board meeting. And then wondering if we were gonna be successful in this almost seven month effort to help get more money for the 158 thousand students of Dallas Independent School District. Rob: I am the director of communications and marketing at The Commit Partnership. And for over a half a year, he’d been working on a campaign to attempt the unthinkable: raise taxes in a Texas city. Rob: The data was pretty clear that this could make a really big difference in a district that is already pretty cash strapped. Spending more to get better quality absolutely ends up positively impacting students and their lives. So Rob and Commit joined a growing group of community advocates, who called themselves Strong Schools Strong Dallas, who were fighting for a Tax Ratification Election, or TRE, a ballot measure to be voted on by residents of the district for an increase in their property tax rate. Which, you might be surprised to learn, was supported by more than just data. Rob: The surveys from the community have convinced us, the calls from the community have convinced us, the meetings with the community have convinced us. It’s an important aspect of the work Commit does. They seek to leverage both quantitative data and qualitative community expertise to provide a complete picture of the school systems they study. And picture was clear: Dallas ISD’s budget, even at over a billion dollars, simply isn’t enough to meet all of its student’s needs. Rob: To the untrained ear, you hear billion-dollar budget, and you think Scrooge McDuck rolling around on his back in the cash. But the reality is when you divide that billion by 158,000 students, the amount per student is significantly lower than the national average. And given where our students are coming from, given the rates of poverty, given the percentage of students that are learning English as a second language, it is completely naïve to think that Dallas ISD can spend the exact same amount per student as more affluent districts and expect the same outcomes. And that is not because of a deficiency of our students, or a problem with our teachers, it is just the reality of it not being a level playing field. Rob: We need to make sure that students that are struggling the most get the most help. This is not about taking a pot of money and dividing it equally across every school in the district, this is about really identifying who are the students who need this the most, and how do we make sure that we help them catch up to their peers. And the sooner we can have real honest conversations about that, and then really work to overcome that, the sooner we’re going to be able to make sure that every student gets an excellent education. Rob: The meeting was incredibly painful. At the end of the night, it was really hard not to see that as a huge lost opportunity for students… it was pretty heartbreaking. Heartbreaking, especially, because Rob is not only an advocate. He’s also a DISD parent. Rob: We’re failing our kids. It almost every instance, parents with higher economic mobility opt out of DISD. They decide the schools are not good enough for their kids, and so they’re gonna make sure that they put their kids in a school where they can get the best education. And my real problem with that is, if the schools aren’t good enough for my kid, I can’t in good conscience say that they’re good enough for other kids. Those are the kids that I thought about during that board meeting. Now, this podcast is not about pointing fingers. As Rob explained, the parents opting out of public school are doing what they feel is best for their children. And the board members voting against the TRE are doing what they feel is best for their community. We’ll get into why later in this episode. But the data that Commit collects, both quantitative and qualitative, highlights just how complicated these issues truly are. And our ability, as a city, a state, a society, to hold to simplified solutions, to refuse to have the hard conversations, to invest in private school for the few instead of public school for all children, comes from decades worth of historical precedent, subtly reinforcing a culture of individualism at the expense of true equity. That’s from the Dallas Weekly Herald, June 23rd, 1877. 140 years later, we’re still having the same conversation. This is the Miseducation of Dallas County. By the 1870s, Dallas was beginning to establish itself as a major city. Thanks in large part to the arrival of a major railway, the population and economy were booming. (4) There was just one thing missing. That’s right, y’all. We’ve had a fair here in Dallas for longer than we’ve had a public school system. …are about as messed up as you’d expect. And the simple fact was, for the property owners whom this tax would have affected the most, private schools, already among the best in the state, were readily available. (9) And compared to the state-funded ward schools that couldn’t afford books and desks (10), the choice of where to invest seemed obvious. Sound familiar? Unfortunately, it was far from the end of the controversy. The political infighting over whose ward got what school only got worse over the next two years. In 1884, the City Council failed to approve the funds needed for teacher’s salaries, and the school year had to end early. (14) It was the final straw for the district’s parents. Which, when you think about, is really something they ought to teach in Dallas schools. The whole reason they get to go to their classrooms today is because of a grassroots effort by concerned citizens. It is the work of journalists, of protestors, of private benefactors donating time and effort. Not bureaucracy or city councils or even tax collectors. And certainly not funding from the state. The Texas State Constitution, ratified in 1845, mandated universal free education, but didn’t actually start providing funds for it until over ten years later, and even then it only amounted to pennies per child. (18) It was a lack of funds from the state that necessitated the entire local taxation controversy. Garrett: There have been a number of cases over decades about the school finance system and the funding mechanisms of Texas. And the most recent one was a five-year process that resulted in the Supreme Court of Texas saying the school finance funding structure was minimally constitutional, albeit it was inadequate and antiquated. The system is no longer really funding districts equitably. There are not the adjustments made year over year to accommodate for inflation. This is Garrett Landry, the Special Assistant on Education Initiatives at the Williams Family Foundation. I don’t really know what all that means, but Garrett knows a lot about school financing in the state of Texas. And it’s not a pretty picture. Garrett: The word antiquated and convoluted doesn’t even begin to describe how complicated our funding system is here. But we’re going to try and describe it anyway. If you’re listening at home or work, we’ve got a visual aid for this part on our website, commit2dallas.org. Please don’t watch and drive. So say every school district gets a bucket for school funding to go into. The size of your bucket, how much the state feels you need in order to educate all of your city’s public school students, is based on attendance. But not exactly. Okay, okay, we get it. There’s a lot of allotments. And these, combined with your weighted attendance, create the magic number that will, supposedly, ensure your district is adequately funded. The size of your bucket. But then… you have to fill it. The majority comes from local property taxes. Each Independent School District gets to set their own rate, and if the money they collect doesn’t meet the bucket size, it’s the state’s job to fill it up the rest of the way. But like many deals made in the Legislature, it’s a double-edged sword. So for instance, Dallas ISD is considered property rich. Again, 90 percent economically disadvantaged, majority of our students come from poverty.They face a lot of challenges. But because we have an incredibly vibrant downtown, and a huge corporate tax base, our wealth per student as the state would describe it is above a certain level to where we’re considered property rich. And because we’re considered property rich, the funding we get from the state is minimal. It’s up to us to fill our own bucket. So the only calculation for that is total taxable value of your district divided by your weighted average attendance, and you get a number. That number is Dallas ISD’s case is just shy of 500,000 dollars per student. If anything is above 319,500 dollars, you’re considered property rich. There’s a second threshold, which Dallas ISD is very close to, which is 514,000 per student. Once you’re at that level or above, it doesn’t matter what your tax base is, you’re going to give local money back to the state. Every year. And as that wealth per student grows, which can happen by declining enrollment or increased valuations, that bill to the state is going to get bigger, and bigger, and bigger. Now, much like the weights, this system was intended to address inequity. Were school districts dependent solely on local property taxes, then rural undervalued areas would be at a major disadvantage. These reclaimed local funds, called recapture, are supposed to be used in addressing that disparity. But also like the weights, this measure has quickly become outdated. The “Equalized Wealth Levels” (the official term for those random numbers that determine whether a district is “property rich”) haven’t been adjusted in over five years. And more troublingly, there’s no law on the books mandating that funds collected in recapture be put back towards education. The State Legislature can do whatever it feels like doing with that money. Were we to raise our property tax rate, the Dallas Independent School District would have to send some of that money back. Our bucket, as the state sees it, would overflow, and we would have to give them the spillover no matter how desperately we felt we need it. And some school board trustees were understandably troubled by the prospect. But it’s important to realize that the money being sent back isn’t considered recapture. Those are copper pennies, something even I don’t understand or have time to explain. The important part is, that fraction of our taxes would be going back to the state regardless of how “property rich” we happen to be. But even after paying some of it back, the district would have still gained millions of dollars it doesn’t currently have. And the fact is, if property values in the city continue to rise (as they have been every year since the recession), we will soon enter recapture with or without an increase to the tax rate. But it’s also important to recognize that adjustments at the local level, alone, can’t achieve equity for the city, let alone the state. For that, we have to update the weights, enlarge the allotments, adjust the Equalized Wealth Levels, and rethink recapture. Maybe even reconsider using property taxes as the means to fund schools. It seems like an impossible task in a state where the legislature only meets every other year, and then spends most of its four-month session debating everything except education policy. But this is where it helps to take a long view of history. Sometimes change plays out not in years but in decades, even centuries. But it has to start somewhere. In the sub-basement at Dallas City Hall, there’s a cavernous storage facility that houses the Municipal Archives. You can make an appointment and pore over old city council minutes, written in ornate cursive on yellowing pages in enormous leather-bound books. And if you know which dates to look at, you can see one of the earliest records of Dallas’ African American community fighting for educational equity before the turn of the century. Keep in mind, this is an era in which even the white schools were severely under-resourced. (19) Schools designated “colored” paid teachers less, had shorter school years, and were more crowded. (20) One school building was on an embankment so high students had to be lifted in one at a time by a rope. (21) Which is shocking, considering these were real children risking their lives just to get an education. In 1882, after a school tax had finally been levied but before it had been spent, Dallas preacher and activist A.R. 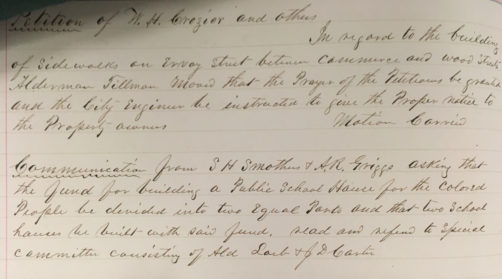 Griggs went before city council to advocate for two colored schools instead of just one. (22) Today he’s recognized as a civil rights legend. We have a park named after him. Back then, his petition, unlike the speeches made by superintendents and city councilmen, was not seen as worth saving. It went unrecorded. Lost to history. This is Chazzmon Roper, a DISD high school senior, speaking before the school board of trustees on the night of the TRE vote, continuing a tradition of advocating for racial equity before Dallas elected officials that had begun nearly a century and a half prior. I wanted to catch up with Chazz after this, to see if he was aware of the history he was now a part of, and hear what that might mean to him. But he’s too busy with college applications, which is a pretty great reason not to be interviewed for a podcast. And anyway, none of the many eloquent speakers who got up there that night were doing so out of a sense of historical continuity. They were doing so because they had a present need to be addressed. But in the aftermath, the pain of political failure, I wanted to offer something that might contain encouragement, to anyone who might feel unheard in the face of adverse decisions made by people in power. We become the stories we tell ourselves. We can assume current discourse will only continue its downward spiral into toxic partisanship, or we can trust in the best intentions of those with whom we don’t agree. We can loudly claim our largest problems are completely intractable, or we can look to the past to see just how much we have already overcome, and more importantly, how we did so. The Dallas Independent School District exists today because of a grassroots effort. It weathered the Depression through the strength of heroic instructors. And it desegregated in spite of complacent officials because enough ordinary people raised their voices. We have not yet reached true equity. But don’t believe anyone who says we can’t get there. The Miseducation of Dallas County is powered by The Commit Partnership and produced by Joshua Kumler. It is executive produced by Joshua Kumler, John Hill and Rob Shearer. Music by Trevor Yokochi. Special thanks to the entire Commit team, as well the Dallas Municipal Archives, SMU’s Fondren Library, and the 7th Floor of the Central Dallas Public Library. This episode’s historical content is heavily indebted to the work of historian Jackie McElhaney and her book called “Pauline Periwinkle,” about the fight for women’s suffrage in Dallas. This podcast is dedicated to educators everywhere. The future is in your hands. We’ll be back next month with more Miseducation. (1) Investing in the Future: Dallas ISD’s Proposal for a Tax Swap or Tax Ratification Election 2017.” Board Docs, Dallas Independent School District, www.boarddocs.com/tx/disd/Board.nsf/files/AQCSZA73F185/$file/TRE%20August%2018%202017%20Final.pdf. (2) Aug 18, 2017 (Fri) Called Board Meeting Agenda and Notice.” Board Docs, Dallas Independent School District, www.boarddocs.com/tx/disd/Board.nsf/vpublic?open. 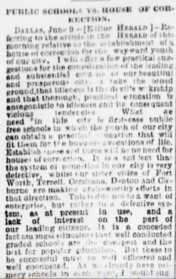 (3) “Defeated But Not Dismayed.” Dallas Weekly Herald (Dallas), 23 June 1877. (4) Enstam, Elizabeth York. “How Dallas Grew… And Why.” Dallas Reconsidered. Originally published in Legacies. 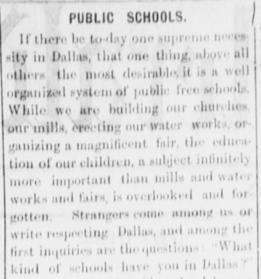 (5) “Publics Schools.” Dallas Daily Herald (Dallas), 29 June 1876. (6) “The Public School Question.” Dallas Weekly Herald (Dallas), 9 June 1877. (7) “The School Tax- Safeguards Demanded- The People Are Awake- Light is Wanted.” Dallas Daily Herald (Dallas), 17 June 1877. (9) McElhaney, Jacquelyn Masur. Childhood in Dallas: 1870-1900. 1982. Southern Methodist University, MA thesis. 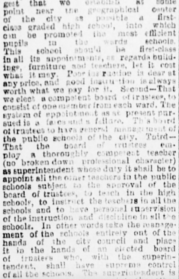 (10) “We did not feel authorized, under the law, as trustees, to expend the fund in purchasing books for those who had none, or in purchasing desks, book-cases, etc.” : “The Public School Question.” Dallas Weekly Herald (Dallas), 9 June 1877. (11) Dallas Morning News (Dallas). 10 Apr. 1931. Quoted in McElhaney, Jacquelyn Masur. Childhood in Dallas: 1870-1900. 1982. Southern Methodist University, MA thesis. (12) McElhaney, Jacquelyn Masur. “Dallas Public Schools: The First Decade.” Dallas Reconsidered. Originally published in Legacies. 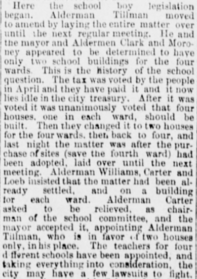 (13) “City Council – Baby Talk About the School Question.” Dallas Daily Herald (Dallas), 6 Sept. 1882. (14) McElhaney, Jacquelyn Masur. Childhood in Dallas: 1870-1900. 1982. Southern Methodist University, MA thesis. 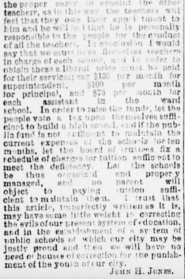 (15) “Public School Vs. House of Correction.” Dallas Weekly Herald (Dallas), 12 June 1884. (16) McElhaney, Jacquelyn Masur. Childhood in Dallas: 1870-1900. 1982. Southern Methodist University, MA thesis. (17) “Common Schools.” Dallas Daily Herald (Dallas), 14 Apr. 1877. (18) McElhaney, Jacquelyn Masur. Childhood in Dallas: 1870-1900. 1982. Southern Methodist University, MA thesis. (20) McElhaney, Jacquelyn Masur. Childhood in Dallas: 1870-1900. 1982. Southern Methodist University, MA thesis. (21) “The streets about this building have been cut down until the house is left like a tower upon an embankment twelve feet high… At this building it has been customary for the teacher to make the ascent first and afterwards let down a rope and draw the little urchins up one at a time.” : Dallas Daily Times Herald (Dallas). 26 June 1890. Quoted in McElhaney, Jacquelyn Masur. Childhood in Dallas: 1870-1900. 1982. Southern Methodist University, MA thesis. (22) Dallas City Council Minutes, 5 Sept. 1882.